Giggling girls and boys are the best sounds at a slumber party with lots of young guests. 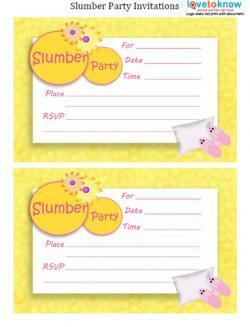 Get everyone to the festivities by sending out special sleepover party invitations. 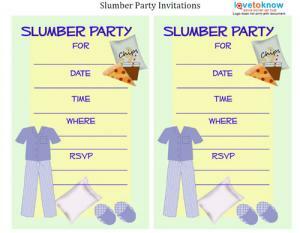 These invitations will reflect the sleepover theme of the party, letting kids know the party's going to be an exciting overnight adventure! 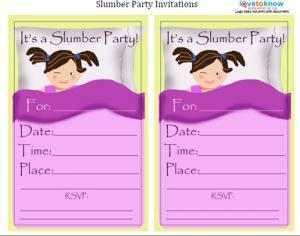 Printing free invitations for the sleepover is a cheap and easy way to get all your children's friends to the festivities. To print the invitations below, click on the image or the blue linked text. The invitations will open in a new window using a PDF program. 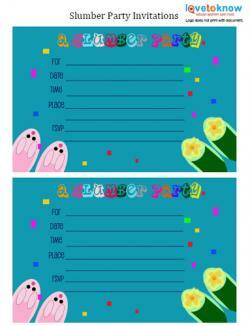 Fill in your information and either save or print the invitations. Before printing, make sure you have plenty of ink left in your cartridges. Using cardstock instead of regular printer paper makes the invitations more durable. Special information, such as "bring your favorite stuffed animal" or "be ready with a scary story to share"
Also, consider asking parents to let you know if their children have any food allergies or sensitivities, since you'll be providing snacks and breakfast the next morning. 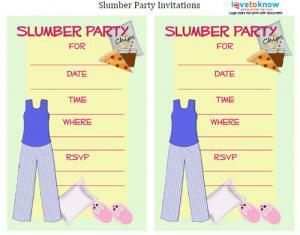 Planning invitations to a slumber party can be a fun way to prepare for the big night. Getting the guest of honor involved in choosing or making the invitations is a great way to begin planning the party together.